Alice Springs lies at the heart of Australia’s red-centre. It’s a modern-day town but importantly boasting a proud Aboriginal culture along with a rich pioneering history from where you can set off to explore some of the country’s oldest natural landmarks. But as Bernie McGuire discovered, the golf course billled as ‘the world’s hottest’ is an oasis awaiting the spirited golfer. Upon arrival into Alice Springs Airport I was asked by a police officer the contents of the long black bag that I was totting behind me. It’s not that I was in any sort of trouble. It’s just that the Northern Territory constable indicated he was not used to the sight of seeing people arriving at Australia’s ‘Red Heart’ packing golf clubs. 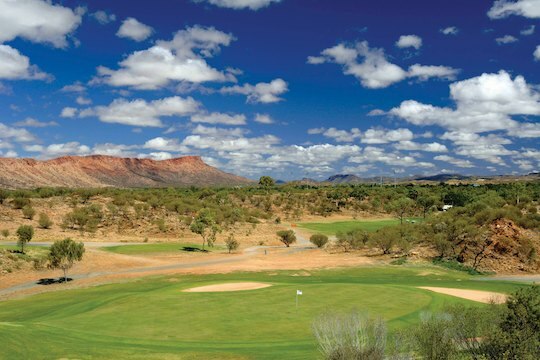 With just one golf course, Alice Springs does not pride itself on being a golfing destination. That’s a distinction Melbourne, the Gold Coast and other resort venues around Australia can fight over. However, Alice Springs Golf Club can lay claim to a distinction the famed ‘Sandbelt’ courses or the resort layouts of Queensland cannot boast and that’s the tag of being the ‘Hottest Golf Course in the World’. Alice Springs can also lay claim to being one of the most remote golf courses in the world, located as it is some 1500 kilometres in either direction from both Darwin and Adelaide. But despite its remoteness, Alice Springs is no longer the dusty, isolated outback settlement. Here’s a modern-day frontier town boasting air-conditioned hotels, restaurants, shops and services laid-out against a rugged, unforgiving backdrop of spinifex red-soil plains, gorges, peaks and chasms that set the scene for a variety of adventures. It may surprise many to learn the Alice Springs Golf Club was founded in 1933 with the original nine-hole course spread out along the banks of the Todd River. The outbreak of World War II saw the course moved to its present site though the original rough dirt fairways and oil-laden putting surfaces of then is nothing like the site that greets golfers nowadays. I could use a well-worn phase and remark Alice Springs Golf Club is an oasis in the desert. But this oasis located slap-bang in the centre of Australia is more akin to finding legendary Lasseter’s Reef. Here is a real hidden golfing gem. Go climb Uluru, take the chopper flight over Kings Canyon, explore Standley Chasm, step back in time at the Alice Springs Telegraph Station and view the works of renowned indigenous artist Albert Namatjira. But before you turn your back on ‘The Alice’ find your way to Alice Springs Golf Club. To draw on Nevil Shute’s description in his novel A Town Like Alice, here you’ll find the richness of a deep blue sky reaching down to the red-brown MacDonnell Ranges that watch over a canvas of vivid green tees, fairways and greens. Stately river gums act like sentries about a golf course shielded by rocky outcrops, lush desert vegetation and where water comes well into play on two holes, though that can easily change depending of course on the time of year. Off the blue tees, the course measures nearly 6200 metres with the usual configuration of four par-fives, two on either nine, and just as many par-threes with the longest being the par-three, 12th hole at 191m. The second hole is rated the course’s ‘Number One’ index and it’s a par-four needing two mighty blows to conquer its 404m length. At the back of the third hole keep an eye out for one most bizarre letter boxes you will ever see – an oversize Mal Meninga dressed in his Australian green and golf rugby league strip. The back nine commences with a 491-metre par four where water runs all the way down the left side of the fairway. Then it’s three gems in succession before the 500m par-five, 14th and the longest hole on the course where hopefully you won’t find a fairway bunker that would not be out of place at the Home of Golf in Scotland. The par-four 16th leads down to the rear of Lasseter’s Hotel Casino from where you do a u-turn to play the 17th where the Crowne Plaza Hotel is to your left rear and a hole where water awaits you guarding the left-side of the green. Alice Springs saves the easiest for last, with the 18th at 346m, a drive and short iron to a receptive green. It was the foresight of club directors who made the decision in the early 80s to upgrade the course to its present international standard. Nevada-based architect Gary Hunt tapped into his Desert Spring design experience while legendary Peter Thomson and partner Michael Wolverige were signed to layout a course just as good and challenging as any A-grade layout found on the east coast of the continent. With their work done, it was a proud day for ‘The Alice’ in November 1985 when American Johnny Miller tackled Australia’s own Greg Norman at the official opening under the banner of the “Fosters Challenge”. It seemed the whole town turned out to witness this ‘Duel in the Desert’. There was more a few Fosters’ downed when Norman, who was eight months shy of winning the first of two British Opens, won the encounter played in searing temperatures. The match heralded the first of many championships at ‘The Alice’ including Australian Junior Boys and Girls Championship titles, the Northern Territory Chief Minister’s Cup, Northern Territory Veterans’ Championships and the Northern Territory Amateur Open. There’s a snap on a wall in the clubhouse of a young Adam Scott taken after he defeated a just as young Aaron Baddeley in the 1997 Australian Junior Championship. There’s also a picture of a teenage Stuart Appleby after winning a Von Nida event with a 24-under victory tally. Stephen Tieck is the club’s professional. If the name sounds familiar it should. Tieck spent nearly 10 years at Federal Golf Club and four years at Newcastle Golf Club. “It’s a bit of a change of scenery and very different to Canberra or Newcastle but I felt I was at an age to explore more of Australia,” he said after taking up appointment in October 2008. Alice Springs Golf Club nowadays boasts nearly 600 members and over 500 social members. Tieck and his assistants also have been busy bringing golf to schools in the region and helping to encourage younger players to take up the ancient game. “We have four primary and three secondary schools involved plus the club has an ‘After School Care Program’ where we conduct clinics for the youngsters,” he said. “Then at the end of each term we bring them up to the club for a gala dinner. From Dreamtime to dreamers, Alice Springs has long lured the most intrepid of adventurers to discover the charm of the Outback. But for the golfer, here’s a destination where you not only can connect with the world’s most ancient living culture but also savour a very unique Australian challenge.